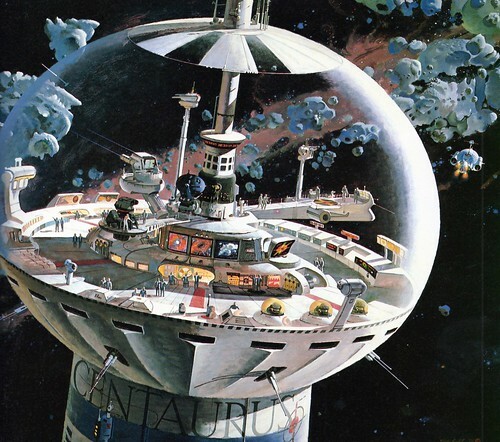 Robert McCall, who passed away at age 90 in 2010, was NASA’s “visual historian” for almost 40 years. He was also a prolific painter of exquisite, utopian visions like those seen above. McCall did the artwork featured on the unforgettable theatrical poster for 2001: A Space Odyssey. He also did production and conceptual art for Star Trek: The Motion Picture and The Black Hole. Below (via subnutty/Flickr) is a rendition of the control tower of the Centaurus. The name of the great ship was changed to the U.S.S. Cygnus for the film. Here are two more beauties. The first one is a six-story-tall mural that appears at the National Air and Space Museum in Washington D.C. 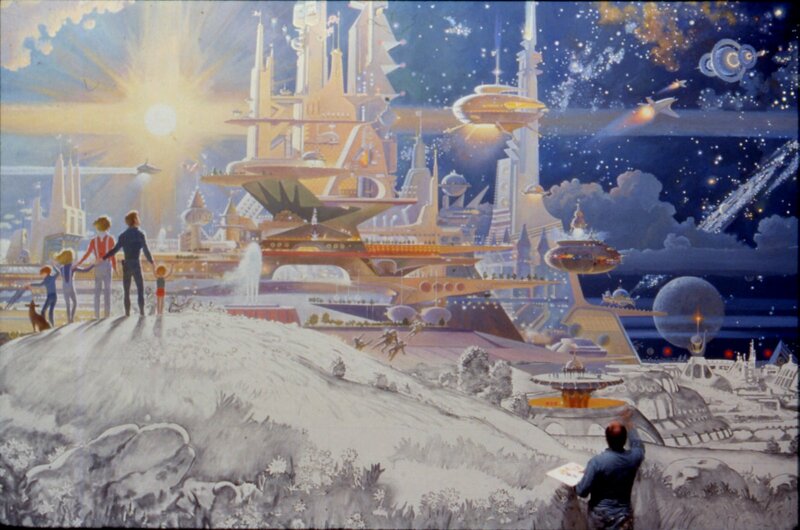 The second is a mural called The Prologue and the Promise that was featured at the end of an Epcot ride called Horizons. Horizons, similar to Disneyland’s Carousel of Progress, was closed and dismantled in 1999 to make way for Mission: SPACE, “a motion simulator thrill ride that opened on October 9, 2003.” It is unclear what happened to McCall’s mural in the process. Read more about the man and his work here. Do not miss the interactive gallery.